Today we released a new CTC paper (pdf) reporting and explaining what we call the good news of the U.S. electric power sector’s rapid decarbonization over the past decade. The paper quantifies the power sector’s sizeable reductions in carbon emissions since 2005 and clarifies what accounts for it. We show that while substitution of fracked gas for dirtier coal contributed significantly to reducing emissions, a greater role was played by clean electricity: an up­surge in electricity production from renewables (wind turbines and solar photovoltaic cells), and electric­ity savings that caused electricity usage to flatten even as economic output increased. By the end of 2016, the U.S. power sector had reduced its emissions of carbon diox­ide by 25 percent since 2005, thus achieving nearly four-fifths of the 2030 carbon-re­duction goal set by the Obama Clean Power Plan. While this suggests the CPP goals were too modest, this is genuine progress, even if confined to electricity (omitting vehicles, refineries, industrial processing, etc.). 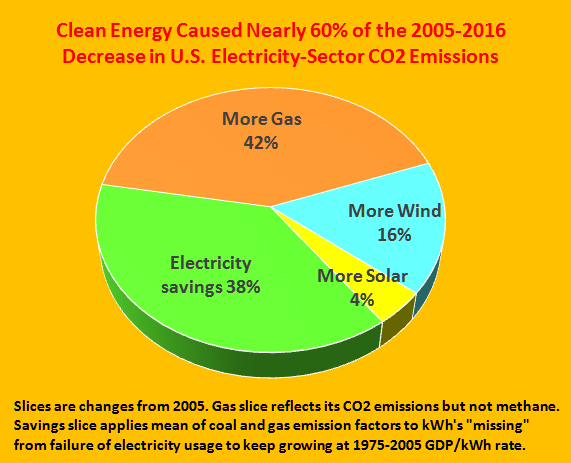 The good news gets even better: we estimate that 58 percent of the electricity sector’s CO2 reduction in 2016 vis-a-vis 2005 was due to clean electricity, and just 42 percent due to replacing coal with natural gas. This finding belies the prevailing narrative crediting fracked gas for reducing coal burning and lowering carbon emissions. The electricity sector’s reduction in carbon emissions is good news not only because of its magnitude but because it effectively “banks” emission reductions against a slowing of progress looming under the Trump administration. The leading role played by clean electricity is good news because it comes without the climate-damaging methane emissions associated with natural gas extraction and transpor­tation, and because it signifies the emergence of a new energy economy built on inherently clean energy production and usage tech­nologies that can scale rapidly, economically and gracefully. While this trend is heartening, far more is needed for the United States to meet its economy-wide car­bon-reduction pledge under the Paris climate agreement, especially in light of the rise in emissions in the transportation sector spurred by cheap petroleum fuels, which we’ve been reporting for two years. That surge underscores the need for robust carbon taxes to stimulate big emission reductions. Key to the emission reductions is the the virtual leveling off of U.S. electricity usage and generation since 2005. Total U.S. electricity generation in 2016 was just 1 percent greater than the 2005 baseline. In fact, electricity generation and use for the entire post-2005 period has been remarkably constant, i.e., flat. This leveling of electricity generation over the past decade is a striking exception to the history of electric power in the United States, when electricity production and use doubled every decade from 1900 to 1970 and more than doubled again from 1970 to 2000. Of course, the post-2005 period includes the Great Recession, whose epicenter was 2009 and from which the re­covery has been sluggish. It’s tempting to attribute the post-2005 flattening of U.S. electricity use to anemic economic growth. But that would be not only simplistic but mistaken. GDP grew by 17 percent during 2005-2016. As we show in the report, if the 1975-2005 relationship between growth in GDP and growth in electricity generation had continued after 2005, then electric output in 2016 would have exceeded 2005 output by 13 percent, rather than the mere 1 percent increase for 2016 over 2005. What we’ve done in The Good News is quantify that difference, in both saved electricity and avoided carbon emissions. In terms of climate impact, the electricity savings in 2016 was roughly as consequential as the vaunted pushing out of coal-fired electricity by natural gas. Indeed, if not for the savings, much of the boom in fracked gas would have been in addition to continued coal consumption. Our “Good News” report is data-intensive. Important note for table: Sector-wide CO2 reduction in last cell (609 million metric tons) is smaller than sum of CO2 reductions credited to gas (371 million) and clean electricity (521 million) because latter figure credits efficiency for averting CO2 increases that would have resulted if electricity use had grown parallel with economic activity. “Briskly Rising Tax” uses rate proposed by former U.S. Rep. Jim McDermott. Year 2016 isn’t shown because of graphic quirk in CTC model. The progress to date in reducing electricity-sector emissions has been accomplished without a price on carbon pollution. Notwithstanding the election result, a carbon tax remains the most powerful policy tool for rapidly driving down emissions in the power sector and, especially, the rest of the economy. The chart at left illustrates just how fast a robust and briskly rising carbon tax could drive down electricity-sector emissions. Such a tax would accelerate the ongoing decarbonization of electricity supply by increasing the returns from substituting zero-carbon electricity sources for fossil fuel generation. 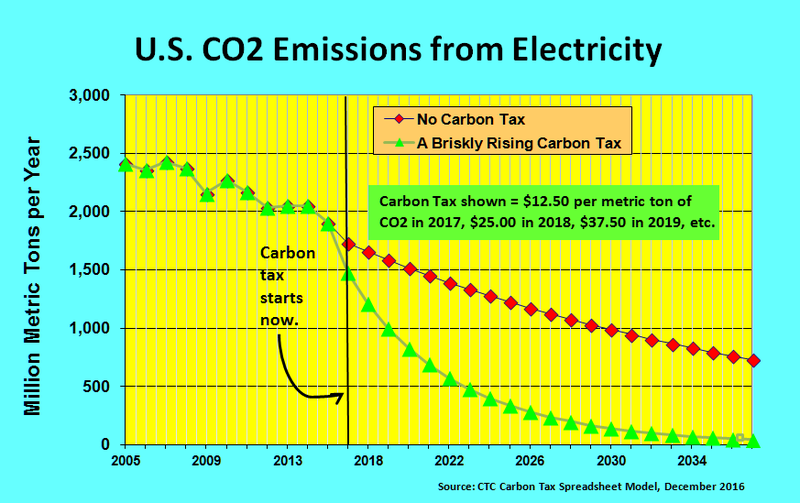 The tax would further reduce emissions by dampening electricity usage through the charge it adds to electric rates; however, that effect would be relatively modest and transitory since the carbon content of each kWh would shrink over time, diminishing and ultimately zeroing out the tax base. We’ve estimated that the carbon tax levels mandated under the McDermott bill would have reduced economy-wide CO2 emissions from fossil fuel combustion — not just from electricity but from motor vehicles, air travel, industry, etc. — by one-third within a decade. While the political hurdles are higher under a Trump administration, the need for a robust carbon tax remains at least as strong as ever. Addendum, Jan. 11, 2017: Today, the Sallan Foundation published another take by us on this topic, Almost Unnoticed, Flat Electricity Demand Is Crushing U.S. Carbon Emissions. It has two new graphs and a bit more detail than this post outlining how and why U.S. electricity use has flatlined since 2005. Nov. 2 addendum: Read Musk’s carbon tax pitch, transcribed from Leonardo DiCaprio’s new climate change documentry, Before The Flood, at bottom. Visionary inventor-entrepreneur Elon Musk is constantly in motion. Last week he was in Nevada checking on his Gigafactory, which purportedly will be the world’s largest-footprint building (as big as 107 football fields) and make enough batteries each year to power 1.5 million Tesla Model 3s. Yesterday Musk revealed his intention to merge Tesla Motors and SolarCity — a $2.6 billion wager that Tesla owners will use those batteries to store power from SolarCity panels. This is big business, big climate and big vision rolled into one. Large-scale deployment of batteries could let solar and wind resources dominate electricity production without need for carbon-emitting grid support by fossil fuel plants. Replacing gasoline-powered autos with electrics will almost certainly squeeze carbon emissions out of transportation faster than biofuels or other low-carbon liquid fuels. In Nevada, Musk also spoke up for carbon taxes, though hardly for the first time. Four years ago, for example, at the Wall Street Journal’s ECO:nomics conference in Santa Barbara, CA, Musk disparaged tax credits for green cars and declared that “the best method for addressing climate change in the automotive industry is to impose a tax on carbon dioxide emissions,” according to the trade journal plugincars. But what he said last week was so richly detailed and articulated that it deserves to be quoted in full. [I]f you accept the scientific consensus[,] every oil burning activity is subsidized, dramatically. If you believe there is a value to the CO2 capacity of the atmosphere and oceans and that CO2 capacity is not being paid for by the price at the gas pump or the coal that is being burned for electricity generation or whatever its use may be then every single fossil fuel burning activity is massively subsidized. [A]ll we are doing [with a carbon tax] is trying to match the inherent subsidy for fossil fuels . . . on the sustainable energy side. Fossil fuels are already getting a massive subsidy if you believe in global warming. If you don’t then [the subsidy] seems really unfair. If you do then it is like oh we are just trying to correct it. The real right way to correct [the subsidy] would be to establish a carbon tax. If you ask any economist they will tell you that is the obvious thing to do, put the correct price on carbon because we currently have an error in the economy which misprices carbon at zero or something closer to zero. It is a fundamental economic error. For people that have a sort of libertarian bent they get a little confused. . . They need to appreciate the high level principle of why they are opposed to government intervention. They are actually opposed to government intervention because it causes false pricing. If the government says we are going to massively incent the production of corn, so that effectively corn gets mispriced and we make too much corn, that . . . does not benefit the country if you make too much of something because of a government driven pricing error . . . That is sort of what people with a libertarian bent are opposed to. However if you have . . . an unpriced externality [with] the CO2 capacity of the oceans and atmosphere priced very close to zero then any government action to increase the price above zero reduces the error in the economy. [What libertarians] should actually be opposed to is anything that increases the error in the economy, a pricing information error. So pricing carbon, if you believe in global warming, does not increase the price of the error it decreases the price of the error. 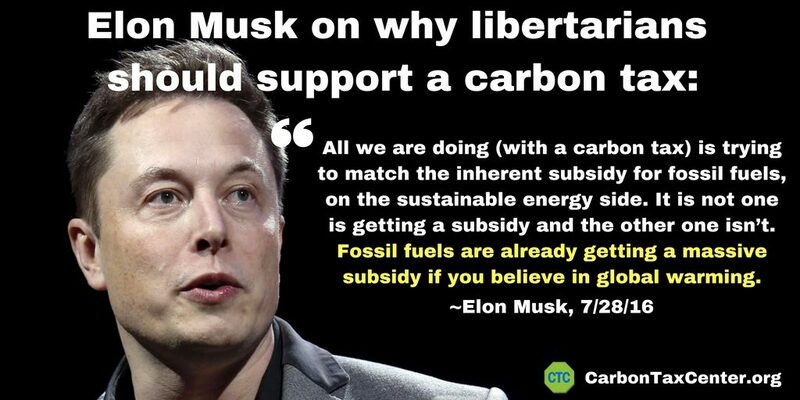 Whether or not you identify as libertarian, you should savor Musk’s bracing clarity on (and for) carbon taxing. Maybe in time, other solar and wind advocates will bolster their customary pleading for subsidies with their own clarion call for carbon taxing. Addendum, Nov. 2, 2016: Musk did a star turn in support of carbon taxes in the Leonardo DiCaprio climate docu, Before The Flood. This transcript is courtesy of EcoWatch. The film is up on YouTube through Nov. 6. Afterwards, only in theaters. Leonardo DiCaprio: That’s it?! That sounds manageable. It’s rare that critiques of carbon taxing are as quantitative as the post last month by David Goldstein on the Natural Resource Defense Council’s Searchlight blog. Goldstein has certainly thrown down the gauntlet. He has four main arguments, which I’ll treat in order. Some math is involved, but it’s central to the issue. 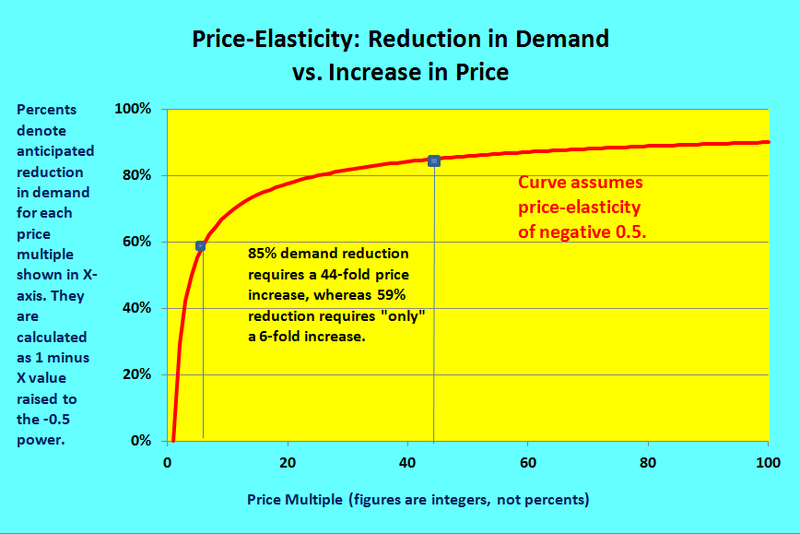 Price-elasticity is how economists denote the extent to which a rise in price causes demand or usage of a good or service to diminish. Assuming, as Goldstein does for argument’s sake (and as we do in modeling carbon taxes), that the price-elasticities of the various forms in which energy is used in the U.S. have an average value of minus 0.5, then a doubling of energy prices, whether effected through a carbon tax or market fluctuations, will cause energy use over time to shrink by 29 percent. (See sidebar for calculations.) With two doublings in price, the shrinkage would be 50 percent. Elasticity math. You can do it. Note that the second doubling in price produces less of a decrease in usage than the first, reflecting the famed Law of Diminishing Returns. Indeed, three doublings, increasing the price 8-fold, would only bring about an overall 65 percent drop in usage. To hit the 85 percent reduction target requires a 44-fold energy-price rise. Goldstein’s math is spot-on. But not the use to which it is put. While an 85 percent reduction in energy use would indeed cure the United States’ carbon obligations (not to mention protect and conserve air, water and land), it far exceeds what’s required, thanks to the ongoing and parallel reduction in the carbon intensity of energy supply. This decarbonization of supply is prominent in energy and climate discourse, and has been evident in the electricity sector over the past decade. Measured as pounds of CO2 emitted per kWh generated, the emission rate for all electricity generated in the U.S. last year was 16 percent less than the rate in 2005. For that we can thank increased generation from lower-carbon natural gas and zero-carbon wind. (Solar electric generation, though growing very fast, started from a tiny base and wasn’t a notable factor in the decarbonization to date.) Energy efficiency has helped as well by reducing the need to fire up high-carbon coal plants. A carbon emissions tax, which by its nature favors wind and solar over gas, and gas over coal, will help sustain and accelerate this encouraging supply-side trend. Indeed, the price-sensitivities built into CTC’s spreadsheet model imply that energy supply decarbonization will account for an estimated 53 percent of the overall projected CO2 reductions from any carbon tax. This means that reductions in emissions via demand, i.e., conservation and/or efficiency, that are Goldstein’s stock-in-trade need only accomplish a bit under half (47 percent) of the total task. 1. “Energy would be pushing a fourth of GDP” (vs. today’s share of ten percent or less), says Goldstein, and, thus, would gobble up too much economic activity. The idea of expensive energy colonizing the economy is definitely a concern in a last-gasp laissez-faire economy in which the costly energy arises through “extreme extraction” of oil from the Arctic, deep waters, and tar sands. But a carbon tax would have the opposite effect, obviating most energy exploration, extraction, conversion, transport and combustion, in accordance with the 60 percent decline in usage posited above. In short, a carbon tax will make our society and economy less energy- and fuel-intensive, not more (while the energy barons, with their wealth clipped, will wield less political power). 3. The carbon tax required to boost energy prices 5- or 6-fold “would be potentially devastating to the poor,” Goldstein argues. Potentially yes, if the wealthy are allowed to siphon off the carbon tax revenues that could buffer U.S. households from the higher energy prices. But the carbon tax designs with the most adherents are those that either use the proceeds to reduce regressive job-killing payroll taxes or distribute them pro rata to households as “fee-and-dividends.” In fact, the need for a socially and economically just distribution of carbon tax revenues only underscores the urgency for environmental progressives to coalesce now behind carbon tax legislation that can safeguard the 90 percent rather than solidifying the advantages held by the top 10 or 1 percent. Goldstein next revisits energy price-elasticity in an attempt to show that its actual value lies closer to a barely behavior-influencing (minus) 0.1 than the more robust (minus) 0.5 figure he granted earlier for argument’s sake. But curiously, he builds his case on a commodity that no end-user actually purchases: crude oil. Refineries consume crude, of course, but the businesses and households whose decisions determine aggregate demand consume petroleum products: The fuels whose price-elasticities need to be estimated empirically are gasoline, diesel fuel and jet fuel ― not crude oil. Using an approach suggested by retired energy economist Vince Taylor, who earned his PhD at M.I.T. 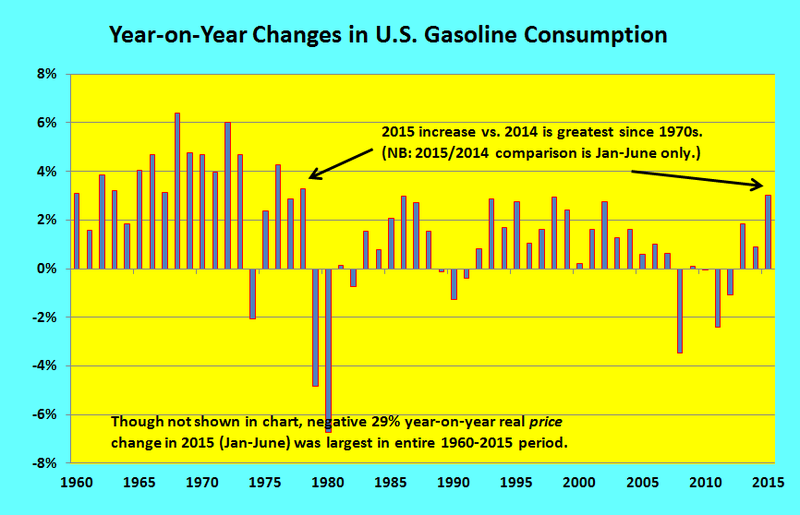 from Nobel laureate Robert Solow in the 1960s, and whose insights animated my 1981 magnum opus on nuclear power cost escalation, I “regressed” the annual percentage changes in U.S. gasoline consumption from 1960 through 2014 on three independent variables: (i) the same year’s percentage change in economic activity (GDP); (ii) the same year’s percentage change in the average real retail price of gasoline; and (iii) the average percentage change in that price over the 10 years prior to the current year. The third variable was intended to reflect lags inherent in Americans’ responses to changing gasoline prices, insofar as automobile purchases and location choices that affect usage tend to change over years rather than weeks or months. The parameters may be referred to as income-elasticity, immediate price-elasticity, and lagged price-elasticity, respectively. One model yielded an income-elasticity of 0.47; an immediate price-elasticity of (minus) 0.12; and a lagged price-elasticity of (minus) 0.21. The sum of the immediate and lagged price-elasticities was (minus) 0.34. From the two sets of regressions, we rough-averaged the respective price-elasticity sums of (minus) 0.34 and (minus) 0.37. The result, a figure of (minus) 0.35, is the price-elasticity we use in our spreadsheet model to estimate the long-term responsiveness of gasoline demand to a carbon tax. In the CTC carbon-tax model we specify higher price-elasticities for other energy-use sectors: (minus) 0.5 for diesel fuel, (minus) 0.6 for jet fuel, and (minus) 0.7 for electricity. We premise them on businesses’ greater capacity to respond to higher energy prices than drivers’, and on our gleanings from the extensive literature of price-elasticity. The takeaway? The price-elasticities of U.S. energy usage, while not necessarily high (all are below one), are not only much greater than what Goldstein suggests; they’re large enough to establish beyond any doubt that taxing carbon emission will indeed reduce energy usage, rather than merely punishing consumers into paying more for the same amount of energy. This [pessimistic] analysis does not apply to actually implemented or proposed cap-and-trade plans, such as the one adopted by California pursuant to AB32 or the one proposed in the Waxman-Markey bill, both of which rely primarily on non-price energy policies. The overwhelming bulk of emissions savings come from (1) improved building and equipment efficiency standards, (2) integrated land use and transportation system planning that meets goals for travel reduction, (3) emissions standards on fuels and vehicles, (4) requirements for utilities to purchase and integrate renewable energy sources, (5) regulatory reforms that encourage utilities to rely primarily on energy efficiency, and (6) a host of other policies that are independent of energy prices. Numerals added; otherwise quoted verbatim. That’s NRDC’s credo in a nutshell, and much of it is admirable — particularly #1, which I touted at the start of this post; also #4, which helped jump-start the U.S. wind-power industry (though perhaps no more than did the federal Production Tax Credit for wind electricity), and #5, an effort in which I participated peripherally as a utility reform advocate at the dawn of the “demand-side management” era several decades ago. On the other hand, it can be argued that the vaunted CAFE standards (#3) were only able to be legislated in the mid-1970s and ramped up several times since then because of rising gasoline prices — somewhat mooting the standards and demonstrating the power of prices that Goldstein largely discounts. Moreover, Goldstein’s #2 is stunningly squishy (“planning that meets goals for travel reduction”); yes, Goldstein had to shoehorn his description but the fact is that NRDC’s standards-and-regulations approach, which has proven so potent in making appliances more efficient, is powerless to rein in the use of vehicles. And therein lies the fundamental difference between Goldstein’s (NRDC) and my (CTC) respective approaches. Miles-per-gallon rules reduce carbon emissions per vehicle-mile driven, but they do nothing to affect the other half of the formula that equally determines emissions: the number of vehicle-miles driven. In contrast, a carbon tax effectively makes every action that reduces fossil fuel use less costly, by raising the rewards from using less fuel. Taxing carbon will open up multiple paths that will influence the literally billions of daily decisions that determine energy usage and, hence, carbon emissions. In driving, a carbon tax will affect whether and how far and often to drive . . . which car to take on a family trip . . . how high an mpg rating to demand in the next lease or purchase . . . and, at the societal level, whether public transit investments “pencil out” and might be prioritized over wider highways, and whether hyper-efficient car designs pencil out in corporate boardrooms and venture-capital spreadsheets. The power of carbon-taxing, in a nutshell. The same goes for other energy-use sectors. Costlier diesel fuel will not only stiffen legislators’ and regulators’ spines in promulgating truck mpg standards; they’ll incentivize local and regional provision over far-flung shipping of food, raw materials and consumer goods, thus cutting down on freight-miles and resultant emissions. Rising electric rates — at least during the decades until carbon fuels are eliminated — will not only strengthen NRDC’s and ACEEE’s case for ever more-efficient appliances; their price pressures will help restrain the size and number of appliances sold and also motivate consumers to use them more efficiently. Costlier electricity and natural gas will likewise discourage developers from building, and families from insisting upon, gargantuan homes whose outsize volumes must be heated and cooled. Not to mention that a carbon tax provides an antidote to the oft-postulated “rebound effect” by which increased energy efficiency, by reducing the implicit price of energy services, can engender greater energy usage and inadvertently cancel some of the intended savings from those efficiencies. A carbon tax acts as a direct brake on that implicit price reduction and, thus, on the rebound effect. The U.S. energy system is so diverse, our economic system so decentralized, and our species so varied and innovating that no subsidies regime, no matter how enlightened, and no system of rules and regulations, no matter how well-intentioned, can elicit the billions of carbon-reducing decisions and behaviors that a swift full-scale transition from carbon fuels requires. At the same time, nearly all of those decisions and behaviors share a common, crucial element: they are affected, and even shaped, by the relative prices of available or emerging energy sources, systems and choices. Yet those decisions cannot bend fully toward decarbonizing our economic system until the underlying prices reflect more of the climate damage that carbon fuels impose on our environment and society. Two carbon tax bills now before Congress — submitted by Reps. Jim McDermott (D-WA) and John Larson (D-CT) — ramp up the tax level steadily and predictably to reach triple digits (i.e., $100 per ton of CO2) a decade on. Our modeling suggests that either bill, by the end of its tenth year, will have reduced total U.S. carbon emissions from fossil fuel burning by more than 30 percent, vis-à-vis 2005 emissions — with the reductions rising as the tax level continues ramping up. As noted, a little more than half of the reductions will come about by sustaining and accelerating the ongoing decarbonization of the U.S. fuel mix, not just in electricity but by motivating increased electrification of sectors like driving that are now dominated by hydrocarbon fuels. The remainder will result from energy efficiency and conservation, i.e., reduced usage per unit of economic activity. Such a carbon tax has myriad other advantages, including the ease with which it can be replicated globally, that no other approach can match. One unsung advantage is that taxing carbon harmonizes with other measures for reducing energy consumption and carbon emissions. My or other individuals’ energy-savings don’t undermine the tax’s effect on other economic actors ― whereas under cap-and-trade, autonomous energy-saving actions lower the price of the emission permits and thus attenuate the price signal. Likewise, a carbon tax reinforces the economic effectiveness of the appliance and vehicle and building efficiency standards so ably championed by David Goldstein and NRDC, just as those standards play an essential role in overcoming the market failures that are hard to counteract with price signals alone. It’s 26 years and counting since my first carbon tax op-ed, and almost 9 years since I co-founded the Carbon Tax Center. We at CTC have long since abandoned the hope that NRDC or the other big green giant, the Environmental Defense Fund, would lead the charge for a U.S. carbon tax. We’re okay with that, but we ask our environmental colleagues to refrain from devising and attacking straw-man versions of carbon taxes. We’ve never said that “carbon emissions fees alone can . . . solve the climate problem.” Rather, we believe that the climate problem can’t be solved without them. Calculations for 9th paragraph in post: If decarbonization of supply is to account for 53% of the CO2 reduction, and reduction in usage for the other 47%, then K, the percentage change in usage needed to reduce CO2 by 85%, is calculated by the equation: K x K x .47/.53 = 0.15. That is solved by K = 0.41, which equates to a 59% reduction in usage. 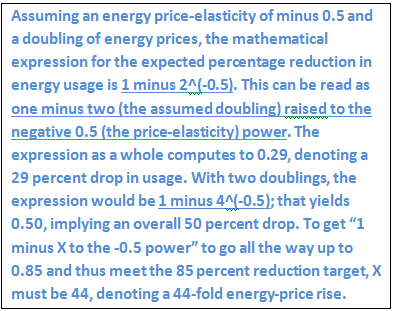 To effect such a reduction, assuming price-elasticity of -0.5, the factor increase in energy prices, M, is given by the equation: M^(-0.5) = 0.41. The solution is M = 5.95, denoting a 6-fold price rise.